Las Vegan Kyle Busch, who started on the pole, dominated the field in the Boyd Gaming 300 in the No. 18 Toyota, leading 199 of 200 laps at Las Vegas Motor Speedway. 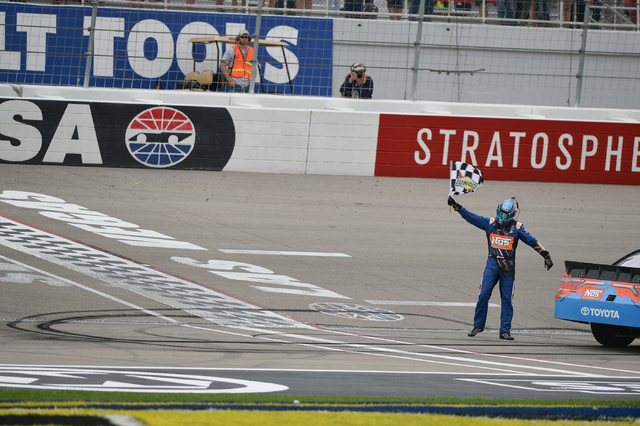 BRETT LE BLANC/LAS VEGAS REVIEW JOURNAL / FOLLOW HIM @BLEBLANCPHOTO Kyle Busch waves the checkered flag for his hometown fans after winning the Xfinity Series Boyd Gaming 300 at Las Vegas Motor Speedway on Saturday. 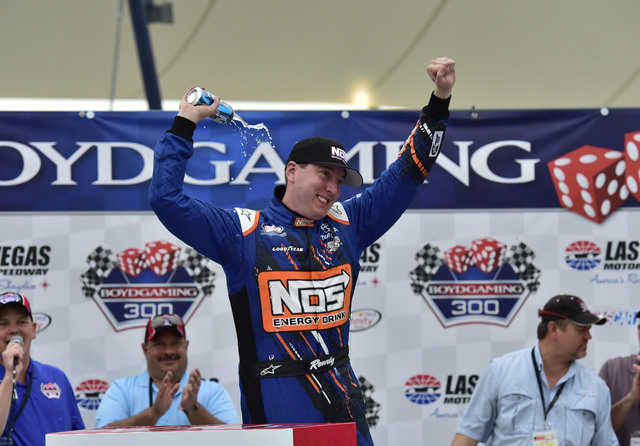 JOSH HOLMBERG/LAS VEGAS REVIEW-JOURNAL Las Vegas native Kyle Busch celebrates in Victory Lane after capturing the Xfinity Series Boyd Gaming 300 at Las Vegas Motor Speedway on Saturday. It was Busch's first victory in NASCAR's second-tier series on his hometown track. 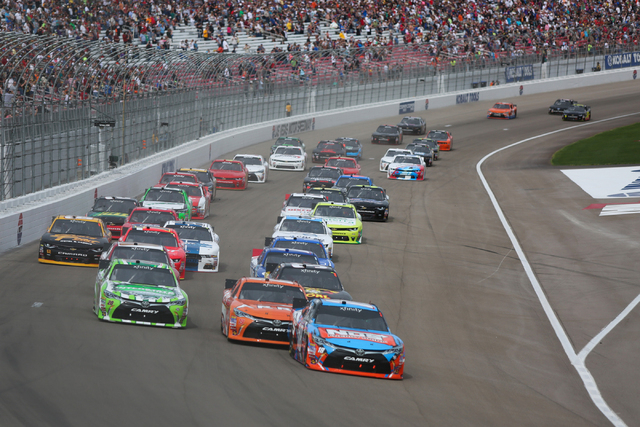 BRETT LE BLANC/LAS VEGAS REVIEW-JOURNAL / FOLLOW HIM @BLEBLANCPHOTO Las Vegas native Kyle Busch (18) leads Daniel Suarez (19) on the first lap of the Xfinity Boyd Gaming 300 at Las Vegas Motor Speedway on Saturday. The racers finished 1-2 after 200 laps on the 1.5-mile trioval. 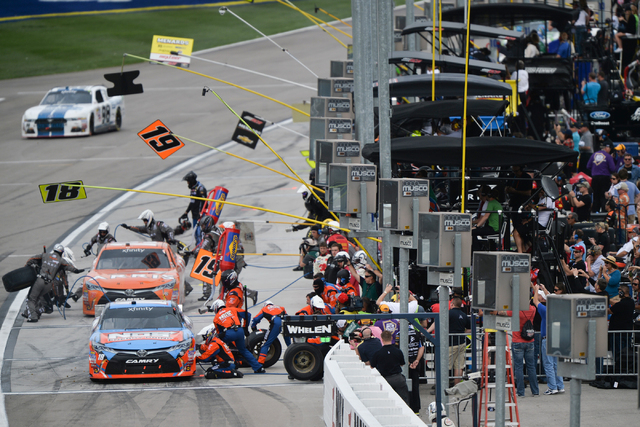 BRETT LE BLANC/LAS VEGAS REVIEW-JOURNAL / FOLLOW HIM @BLEBLANCPHOTO Kyle Busch (18) and Daniel Suarez (19) make pit stops during the Xfinity Series Boyd Gaming 300 at Las Vegas Motor Speedway on Saturday. Kyle Busch’s laundry list of racing achievements is long and varied. The Las Vegan won the NASCAR Sprint Cup Series championship a season ago and is leading the standings this year. But one thing Busch had never done was win an Xfinity Series race at his home track. 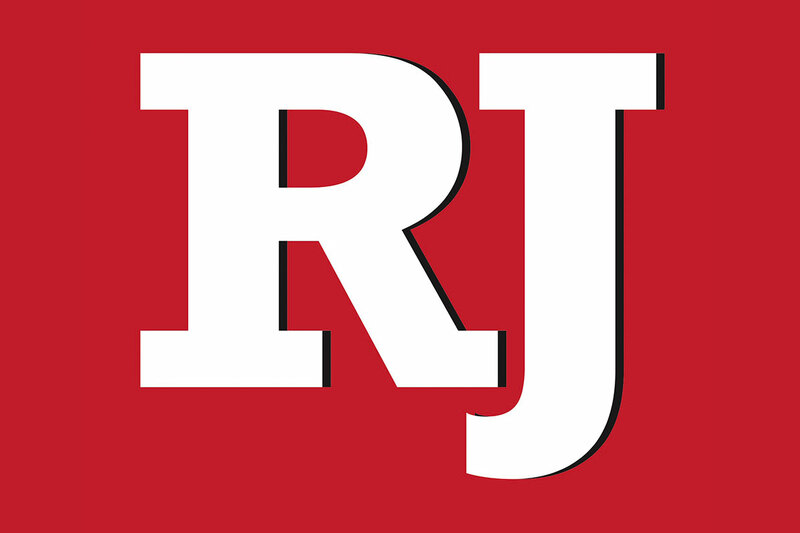 Busch, who started on the pole, dominated the field in the Boyd Gaming 300 in the No. 18 Toyota, leading 199 of 200 laps at Las Vegas Motor Speedway. Busch edged teammates Daniel Suarez by 0.817 seconds and Erik Jones as Joe Gibbs Racing swept the first three places. It was Busch’s second consecutive Xfinity victory after finishing 0.466 seconds ahead of Kyle Larson a week ago in Atlanta. It also was his 78th career Xfinity victory, extending his own record. This one was one of his most dominant. Busch led 99 of the first 100 laps, losing his lead briefly on the 55th lap to Bubba Wallace when he took a green-flag pit stop. The race was stopped on the 137th lap after Cody Ware spun out and was hit by the backside of Wallace’s car. Wallace was subsequently hit again by Justin Marks and went into the wall. “It was a hell of a hit, but thank the Lord that we all walked away OK,” Wallace said to Fox Sports. Wallace’s was one of a handful of cars running on the lead lap at the time of the crash. The red flag paused the race for almost 20 minutes, but when it resumed, Busch picked up where he left off. He had to fend off a late-charging Suarez, who got within half a second of Busch. “Honestly, in the last 10 to 15 laps, maybe we were the fastest racecar out there,” Suarez said. Busch said Suarez was closing in on him because he was faster when they were single file, but he was moving better than Suarez through traffic near the end. With his second-place finish, Suarez took the lead in the Xfinity Series after three races, but he has yet to win an event while Busch has won two. “For me, that means that we have to keep working and work a little bit more hard because somebody else out there is still faster than us,” Suarez said. For Busch, the focus now turns to today’s Kobalt 400 at LVMS, where he will attempt to widen his lead in the Cup standings.